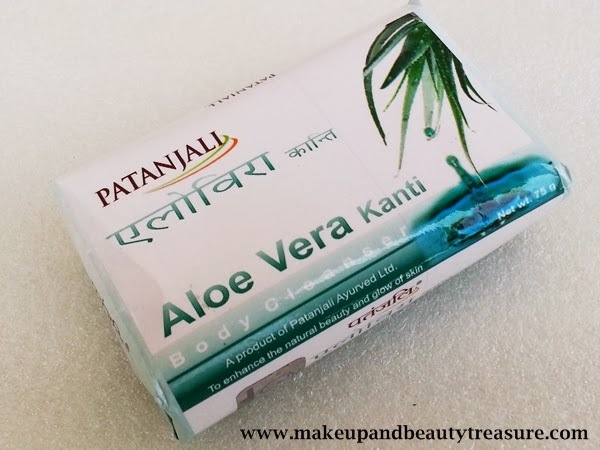 Patanjali Aloe Vera Kanti Body Cleanser comes sealed in a white paper wrapper with aloe vera leaves designed over it. 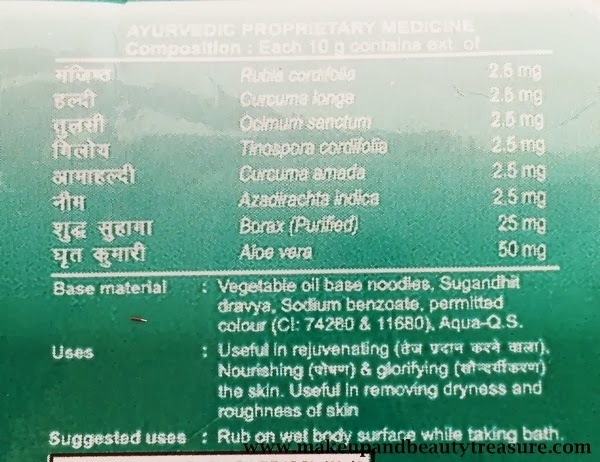 At the back of the cover, you will get all information regarding ingredients and uses. 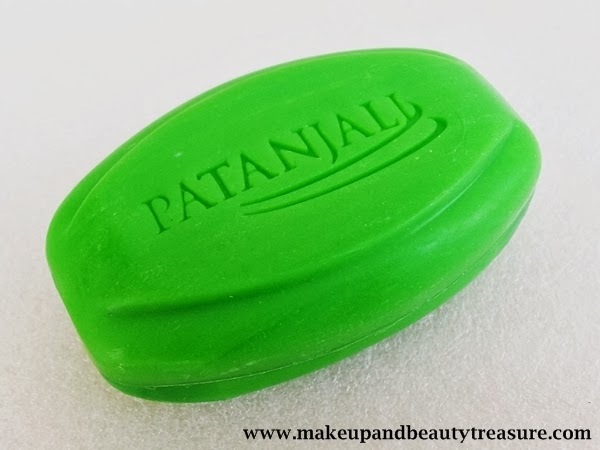 The soap is gorgeous green in color with Patanjali embossed over it. It is oval in shape and smells just like a normal soap. The scent is neither very strong nor very mild. I was wondering if it would smell like aloe vera but it does not. The soap creates a plentiful of lather when used with and without body scrunchie. By looking at the price tag I thought it would only feel like some cheap soaps but it feels really soft on the skin. The scent does not tend to intensify while bathing but vanishes away as soon the soap is rinsed away. As I am not a big fan of fragranced products, the vanishing of the scent does not bother me a bit. It removes all oil, dirt and grime off my skin without stripping off of moisture. I have been suffering from dry body skin in chilly winters and Patanjali Aloe Vera Kanti Body Cleanser neither moisturizes my skin nor dries it out. I have the habit of applying body butter anyways. It is easily rinsed away without leaving a greasy or sticky residue behind. My skin feels soft and thoroughly cleansed after using this soap. It does not melt in the soap dish unlike other soaps. My cousin is suffering from extremely dry skin and she finds this soap pretty useless. She told me this soap makes her skin dry and rough. • Creates soft and rich lather. • Makes skin soft and squeaky clean. • Does not melt in the soap dish. • Suits almost all skin types except very dry skin. • The color of the soap is bright and lovely. • Does not suit extremely dry skin. Patanjali Aloe Vera Kanti Body Cleanser is a decent soap that removes dirt and grime off the skin making it soft and squeaky clean. It neither moisturizes the skin nor dries it out. It creates decent lather and smells good. It does not leave greasy residue behind. Although I love using moisturizing products in this chilly season but I would like to use it again in summers when my skin would become normal. I would definitely recommend it to everyone. 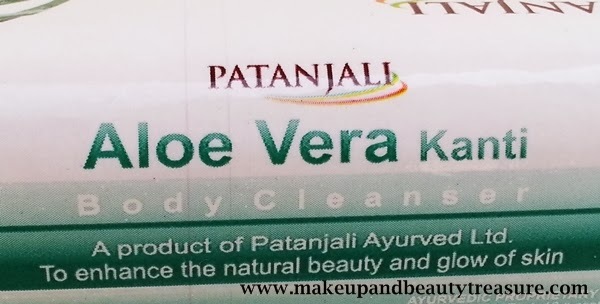 Have you tried Patanjali Aloe Vera Kanti Body Cleanser? How was your experience? Share in the comments section below! It sounds good, I knew about this but never tried it as I always prefer body wash and Dove soap to take bath with. Nice clicks and review sweets. Seems like a good product! Nice review Megha! 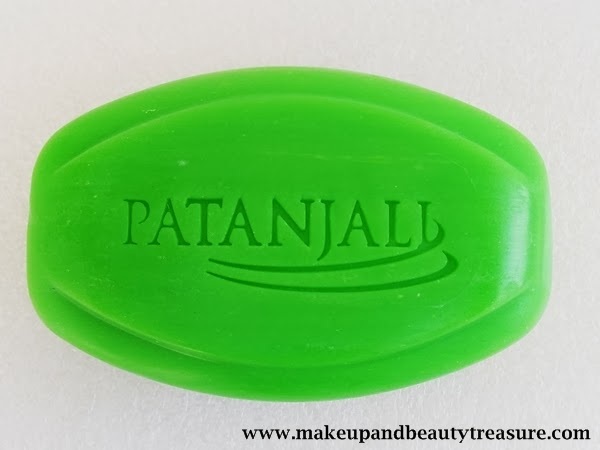 patanjali have some really nice products and this looks great too! love the clicks! Thanx Nats. Which one ??? I am using this since a week...strange!! hehe. is this product suits only for girls? Its for both men and women! No for that use the multani mitti soap! which soap is best for hair? you can check the pictures. nothing is mentioned regarding TFM!